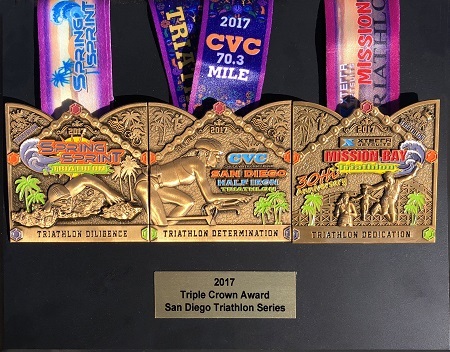 Complete the Xterra Wetsuits Spring Sprint Triathlon, Chula Vista Challenge and Xterra Wetsuits Mission Bay Triathlon in the same calendar year and receive the coveted Triple Crown Award. The Three Medals from Each event come together to form Triathlon art! Sign up now for all three events to ensure your Prize! Medals from the 3 Triple Crown Events come together to form Triathlon Art for your wall. As an Added Bonus, this years award also holds more event medals for your display.